Life is nothing if not resourceful. If there's an environment, it's very likely that some living thing will have adapted to living in it. In the last decade or so, with genomic sequencing as routine as it has become, researchers have been taking samples from a variety of environments and sequencing them to see what's there. Craig Venter, e.g., launched his Global Ocean Sampling Expedition in 2004, sailing his yacht around the world for 2 years collecting samples of ocean water and then sequencing everything he found in the hopes of identifying unknown microbes. And he did, discovering "more life forms than anyone in history," according to the New York Times. And recently researchers found previously unknown organisms in acid mine drainage by sequencing everything that cropped up in their samples. We blogged about that here. Now researchers are reporting 'extremophile bacteria' from soil samples taken from volcanoes in the Atacama region of South America. 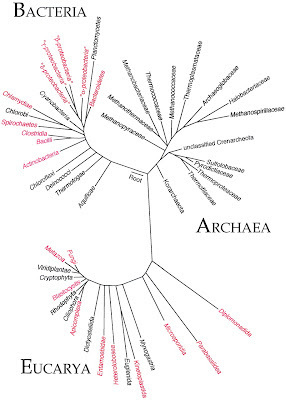 In fact, bacteria, fungi and organisms from the branch of life called archaea, the third domain along with bacteria and eukaryotes. 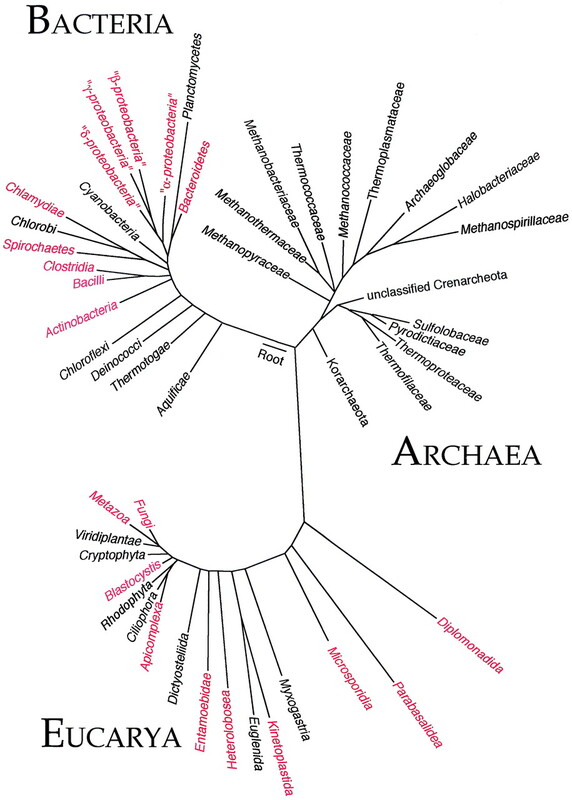 Archaea, single-celled organisms with their own evolutionary history, were once thought to live only in extreme environments like deep sea vents or hot springs but it turns out they can be found just about anywhere, including the human colon. Not just for its own interest! Speaking of extremes, bacteria living in underwater thermal vents (hot springs) were discovered some time ago and turned out to have extreme importance to biology. Like any organism, Thermus aquaticus has to copy its DNA when it reproduces (by dividing). Copying DNA requires a polymerase protein, that moves along a DNA strand and makes a copy, by grabbing appropriate matching nucleotides and stringing them together. But at high temperatures most proteins lose their 3-dimensional shape and don't function. But T. aquaticus's polymerase doesn't come apart in that way at high temperatures. So a few decades ago, scientists including one Kary Mullis, developed a way to extract and use T.a's polymerase in a machine, to make copy after copy of any fragment of DNA you put into a test-tube along with the polymerase, some nucleotides, and the kind of solution required for DNA to be copied. That reaction is called PCR (Polymerase Chain Reaction), and it allows us to clone or increase the amount of DNA in countless kinds of experiments, including DNA sequencing, that are at the basis of much of modern molecular and evolutionary biology. These newly discovered volcanic micro-organisms appear to have a way of converting energy that hasn't been seen before. They are being characterized as being 5% different at the DNA sequence level from their closest relatives -- a difference that's in same ballpark as the estimated genetic difference between humans and our closest relatives, chimps. That is, not terribly different. Life gets little encouragement on the incredibly dry slopes of the tallest volcanoes in the Atacama region, where [Ryan Lynch, a microbiologist with the University of Colorado in Boulder, one of the finders of the organisms]'s co-author, University of Colorado microbiologist Steven Schmidt, collected soil samples. Much of the sparse snow that falls on the terrain sublimates back to the atmosphere soon after it hits the ground, and the soil is so depleted of nutrients that nitrogen levels in the scientists’ samples were below detection limits. Ultraviolet radiation in this high-altitude environment can be twice as intense as in a low-elevation desert. And, while the researchers were on site, temperatures dropped to -10 degrees Celsius (14 degrees Fahrenheit) one night, and spiked to 56° C (133° F) the next day. How these micro-organisms survive is still an open question. Lynch and Schmidt and colleagues looked for evidence of photosynthesis or chlorophyll, but didn't find it (it's not clear from the press piece whether this was in the fungi or all the micro-organisms; we'll have to await the paper soon to be published in the Journal of Geophysical Research-Biogeosciences). "Instead, they think the microbes might slowly convert energy by means of chemical reactions that extract energy and carbon from wisps of gases such as carbon monoxide and dimethyl sulfide that blow into the desolate mountain area." These guys are apparently not fast-moving, so don't need a whole lot of energy. But the researchers suggest that it's possible that these organisms are making energy in a way that isn't yet known -- this seems unlikely to us because 5% genetic difference doesn't seem like enough to support a whole new metabolic process. The diversity of life in this particular ecosystem is pretty sparse; they identified only 20 or so in these samples. The microbiologists, used to finding thousands of lifeforms in soil samples of the same size, say this is likely to be due to lack of water. Not to be satisfied understanding the extremes of life on Earth, the team of microbiologists is teaming up with astrobiologists with the idea that the conditions in the Atacama region must be as close to those on Mars as anyplace on Earth. But that's not why we like this story -- in fact, that makes us like the story a little bit less. Why can't these organisms be interesting in and of themselves, for what they tell us about the extremes of life on Earth, as well as the evolutionary principles that drive the ways that life has adapted to just about any condition the Earth throws at it? Indeed, to us this finding is another piece of evidence for the beauty of evolution, that life here on Earth is eminently adaptable. This is one of the fundamental principles of life we've written about numerous times, including here, and in our book. To us it helps explain and predict the kinds of diversity we see wherever we look. Prokaryotes and phungi -- two more entries in Holly's evolutionary P Hall of Fame.